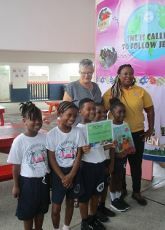 grandson’s presented $600,- to the Sister Marie Laurence School” PHILIPSBURG (April 25th, 2018) — The Philipsburg Jubilee Library partnered with former librarian Mrs. Barbra Arrindell and archivist Julian Arrindell as they donated funds that were raised by Chr. Dalton Primary School “ De Maten” school in the Netherlands where their grandsons, Tim who is in group 5, Ravi in group 2, and Stan in group 1, go to school. The monetary donation was collected at the request of Jenny Valk, the director of the primary school and it was meant to be donated to a school that was in dire need of some assistance after the passing of Hurricane Irma on September 6th, 2017. St. Maarten archivist Julian Arrindell was born and raised in the Middle Region district. 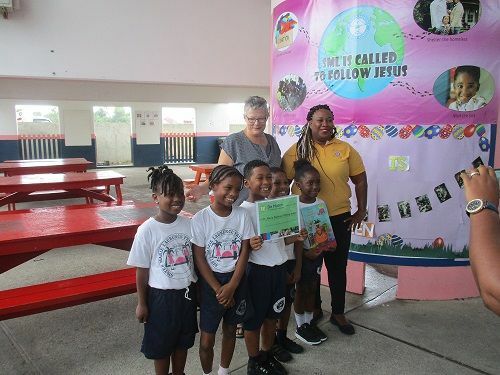 As a proud grandfather, he opted, together with his wife, former librarian of the Philipsburg Jubilee Library, to assist their grandchildren’s school by bringing their school community funds to St. Maarten to be donated to a school in need. After hearing that the school in his district had been severely damaged by the storm the logical choice became clear to assist Sr. Marie Laurence School and their students; which is one of the six Roman Catholic schools on our island. The school building is damaged in such a way that it has to be demolished and rebuilt hopefully by the next school term. Currently, a number of groups are still being taught, however, group 1, 4, 7 and 8 are temporarily being housed at the other Catholic schools. Sr. Marie Laurence School Manager Karen Wattley was excited and honored when Public Relations and Activity Coordinator of the Philipsburg Jubilee Library, Maryland Powell approached the school on behalf of the Arrindell’s family. The monetary donation will go towards purchasing their mascot PB Rex that had been stolen during the looting and vandalism directly after the passing of Hurricane Irma. The Mascot PB Rex represents their program for Positive Behavior Support, where students receive a token for good/ positive behavior. With ten tokens a student has earned a place on the monthly Wall of Fame and they also receive encouraging bracelets given as a token that reflects their achievements. The students are crazy about PB Rex and the bracelets, but unfortunately, they both disappeared in the aftermath of hurricane Irma. The funds came in on time as they will be purchasing a new PB Rex mascot and bracelets as the program has not ceased, it is now being used provisionally. On Wednesday, April 18th, 2018, the money was handed over to the students and teachers of the Sister Marie Laurence School by proud grandparents Mr. and Mrs. Julian and Barbra Arrindell and the Philipsburg Jubilee Library’s Public Relations Officer and Activity Coordinator, Maryland Powell. In addition, on this occasion, the students were treated to a storytelling session and the school received 3 cases of Dutch books that were donated to the school for their reading pleasure. Besides the Sister Marie Laurence School, Asha Stevens Hill Side Christian Campus and Methodists Agogic Centre Campus, and Browlia F. Maillard Campus received one case of Dutch books each for their school library. The Philipsburg Jubilee Library is proud to support Mr. and Mrs. Arrindell in their efforts for the schools. The library provides many services and is not just limited to books. We are a central hub of our community. Visit your library, walk-in or visit us online@ www. stmaartenlibrary.org, Facebook: stmaarten.pjlibrary, or on twitter: sxmlibrary. So as we all face some challenges due to the consequences of Hurricane Irma, we are moving forward, working hard towards a temporary building as we continue to serve you within our current situation. We are open to YOU!